I am preparing now to give a presentation at the Antiochian Orthodox Institute in the Fall on the topic of divinization or theosis according to St. Isaac the Syrian. I have been enjoying reading through the latest edition of St. Isaac’s homilies, and when I was asked to present a small lecture on some aspect of the topic of theosis, I suggested that my focus be St. Isaac. Most of the time, when Orthodox Christian people speak about theosis, they focus on the language and patterns presented in the Philokalia. Specifically, following St. Maximus the Confessor, we usually speak of three steps or phases in the process of theosis. [By the way, theosis–also sometimes called deification or divinization–refers to the process or experience by which one becomes, by Grace, more like Christ, that is more like God]. The three steps or stages of theosis according to St. Maximus the Confessor and the tradition of the Philokalia are these: purification, illumination and theosis. Illumination refers to the knowledge of God, again and always granted by Grace, that transcends the rational aspect of our minds. This knowledge of God is often referred to as noetic after the Greek word for ‘mind’; however, in this context it does not refer to ‘mind’ as we usually think of the word in English. It refers to the aspect of our mind that is open to and perceives spiritual, heavenly realities. There is no equivalent word for this aspect of the mind in English, which is why the Greek word noetic is generally used, although the words ‘heart’ and ‘spirit’ are sometimes used in English to try to get at this higher or deeper knowledge: for example, we might say something like “knowing God in your heart” or “to know God spiritually” to try to distinguish this kind of knowledge from merely rational knowledge, knowledge about God. The third step or experience of theosis in this philocalic pattern is to actually participate in the Grace of God to such an extent that one becomes, as the Fathers say, a god by Grace: that is, one acquires the Mind of Christ (to use St. Paul’s expression), or partakes of the divine nature (to use St. Peter’s expression), or one loves as God loves (to use St. John’s oft repeated expression). Another way the Fathers talk about this final stage of theosis is that one shines with or reflects the Grace of God without ceasing to be oneself; without ceasing to be a creature, one shines with or reflects the uncreated Light of the Creator. This Grace or Light is also sometimes referred to as the Energies of God by the Greek Fathers. Certainly this way of speaking about thesis (purification, illumination and theosis) as it is found in the philocalic tradition is useful and thoroughly Orthodox, but it is not the only Orthodox way to speak of this process or experience of becoming more and more like Christ. St. Isaac the Syrian (+700) was a near contemporary of St. Maximus the Confessor (+662), but he lived in a very different part of the world–outside the Byzantine Empire–and he did not write in Greek (he wrote in Syriac). Although St. Isaac does not use the same vocabulary or the same imagery that many of the Greek Fathers use to speak of the experience of theosis, he nonetheless speaks of a transformation or transfiguration that one goes through as one draws nearer to God. St. Isaac uses several different images to speak of this process or experience. One image he uses (in Homily 62) is that of three different kinds of knowledge: Carnal knowledge, natural knowledge and knowledge of the truth. I find this particular image or way of speaking about our transfiguration in (and into) Christ to be particularly helpful because St. Isaac uses this image to speak directly about the Christian experience of fear. Many Protestant and Catholic converts to Orthodox Christianity have a very perverted understanding of the fear of God that torments them to no seeming end. Unfortunately, for some converts the only way they have been able to deal with the pain that their perverted understanding of fear has caused them has been to reject completely the notion of fear in relation to God. Of course this is not a very helpful strategy because we do actually experience a kind of fear in our relationship with God and denying its existence leads only to delusion or worse. But St. Isaac can help us here. In many of St. Isaac’s images of the Christian journey, he speaks of the transformation of fear, and of the various kinds of fear we experience as we grow in our relationship with God, and of how all of these fears eventually dissolve or transform into love. This particular image of the three knowledges, or kinds of knowledge, is no exception. St. Isaac speaks of two kinds of fear linked to the first two kinds of knowledge. These fears, however, are “swallowed” by love as one comes into the third kind of knowledge. The first kind of knowledge is called knowledge of the flesh, or carnal knowledge. Carnal knowledge, according to St. Isaac, refers to a subhuman knowledge: knowledge of oneself, of the world and of God in a way that is sub-natural, or not according to nature, or not according to reason. When one knows with carnal knowledge, one perceives according to the impulses of the flesh, of the fallen nature, or in accord with the temptations of the demons. One who knows according to carnal knowledge, St. Isaac says, fears death “as an animal fears slaughter.” For someone with this kind of knowledge, the fear of God consists mostly in the fear of death, and in the fear of losing those things that one has come to associate with power over death: political power, the perception of control, wealth, authority, etc. Thus, the fear of God, when one knows only according to the knowledge of the flesh, is a fear that God will take something away from us, a fear that God will kill us or diminish our lives in some way. A carnally minded person is often superstitious in his or her relationship with God. It is a relationship that is full of fear and appeasement because, as we all know, death is inevitable; and so long as one fears death “as an animal fears slaughter,” one is in a kind torment trying desperately to postpone the unavoidable. 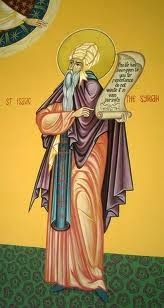 The second kind of knowledge comes as one draws near to God with what St. Isaac calls natural or reasonable knowledge. When we begin to overcome animal appetites and urges through reason and begin to perceive through observation of the world and of ourselves that A) there is a Creator and B) I am not Him, then we also begin to know naturally that this Creator will demand from us an account for what we have done with our lives. Thus the fear that is associated with this second kind of knowledge, this rational knowledge, is the fear of judgement. According to St. Isaac, this rational knowledge is our natural knowledge, or our natural way of knowing reality; and the fear of judgement that comes from this natural knowledge is the initial motivation or the “rod” we use to control ourselves. The fear of judgement, then, is the kind of fear St. Isaac associates with the natural or rational knowledge of God, ourselves and of the world. Although there is a kind of fear associated with this kind of knowledge, St. Isaac points out that rational or natural knowledge is the “proper” and “fit” place or condition from which we can begin to actually draw near to (and thus become more like) God. As we proceed forward, “guided by [natural] knowledge and discipline” we draw near to God and begin to know “the truth by the active participation of the mysteries of God, and [we] become steadfast in [our] hope in things to come, [and thus we are] swallowed up by love.” Not only are our fears swallowed up by love, but our whole being is swallowed by love. The trials and tribulations of life, our continual experience of fall and repentance, and the continual judgement of ourselves by our own conscience followed by the sweetness of forgiveness that we experience as we over and over again confess our sins, all of this experienced again and again throughout a lifetime convinces us, not by theory but by actual experience, that we are indeed sons and daughters of God, that we are indeed among the beloved, that we have indeed passed from judgement into Life. Fear of judgement slips away as we judge ourselves. The Love of God swallows us as we perceive within ourselves the action of Grace and as our hearts swell with pity, with the compassion that God Himself has and has shown through the Incarnation and the Cross for all creation. Here there is no fear–only love consumes everything. And for St. Isaac, as I read him, to love as God loves is to be what God is, in as much as it is humanly possible by Grace. I want to stop here, on the mountain top, at the crescendo; but I must go on. I must explain two more things before we end. First I want to be clear that this is only one of the ways St. Isaac talks about the process or experience of theosis, of becoming more like Christ. He uses other images, types and patterns, some of which I hope to present in my little speech next Fall. Second we must also understand that although these three ways of knowledge that I have presented here represent a kind of progression, they by no means represent distinct steps or states or experiences. Movement from the knowledge of the flesh to natural knowledge is not like crossing a line: it is not as though one moment you are on one side of the line and the next moment you are on the other side. Rather, the progression that St. Isaac seem to be envisioning is more like a sunrise. The light of a higher knowledge begins to dawn even while we are still surrounded by the darkness of a baser perception of reality. And even as the light of a higher knowledge shines with noonday brightness, still there are shadows, still there are animal appetites and broken memories and demonic arrows that assail us, sometimes it seems, like the constant dripping of a rainy day. Throughout his homilies, St. Isaac warns us never to think we have arrived. The greatest ascetics fall, how much more must we then be aware of our own shadows. But even a fall, even a great fall is not the end. St. Isaac tells us that a great fall, if we confess our sin, then even this can be the beginning of a new humility, a new knowledge of the mystery of God’s love.